Looking for volunteers to help out this Saturday at an event for the City of Adelaide Clipper Ship in Port Adelaide. Needing people to be both in an IRB and on the shore. 10pm-5pm, hoping if we get enough volunteers we can do shifts rather than keeping the same people on all day. Please contact Georgia on 0408841160 or Neil on 0417478512 for more info or if you can help out for a few hours. We are happy to announce the dates for the 2014 Presidents Cocktail Party and the 2014 Annual General Meeting. The Cocktail Party will be held on Saturday the 12th of July. The Annual General Meeting will be held the following afternoon on Sunday the 13th of July. More details regarding times, venues etc will be released soon so keep checking our new website! 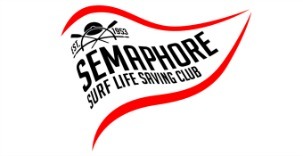 We are looking forward to what will be a memorable weekend for the Semaphore SLSC! Both sessions are to held at the State Aquatic Centre, Morphett Rd Oaklands Park. This event is open for competitors from U12 right through to Masters (age as for the 2013/14 season). We are now seeking expressions of interest for this event. Can you please let Karin Humphrey (0403221592 / kaz412@bigpond.com) know by Wednesday 21st May if you are keen to compete. Please refer to the below link for further information including the list of events. Please ensure that if you let us know you want to compete that you are committed to this event. This will make it a great deal easier when organising teams. Once we have numbers confirmed training sessions will be organised to demonstrate/practice events. Just when you thought the Surf Season was finished a few hearty soles (11 of us) ventured down to Somerton for the 1st IRB Carnival (4 in total this year plus States) on Sunday 4th May. Some very good results overall fielding teams in the Opens , Masters & Females in near perfect conditions. Highlight of the day being Nick Penny (Driver) & Ben Mahney (Crew) coming first in their heat of the Mass Rescue. Masters : Too cold for them !!!! The boys got off to a flyer with and finished a healthy 3rd in the heat , and 5th in the final. What a start , the boys finished 1st in their heat , but due to an over zealous official, got picked up on a technicality and was D.Q.’d , watch this space as the they will be a force to be reckoned with. The teams tried very hard but again got pinged on another technicality and was subsequently DQ’s , BUT as least Trent Bampton ended up in the ocean as a patient !!!! Unfortunately we missed getting the patient to the start line in time before the start and so were DQ’d , pity as we were HOT FAVOURITES for this event !!!!! Reckon the boys got 4th in their heat and 5th in the final. Our first ever female IRB Driver in competition , great stuff Bec , finished 4th in the heat. With Dot Moffat as our Official on the beach , Georgia Kenny as the team manager , Ailsa & Carmel as the catering officers we all had a great day ,NEXT CARNIVAL PORT NOARLUNGA , SUNDAY 18th MAY why not come down to support or better still take part !!!! P.S. Terry Purdie , your left over chocolate donuts and pastries were fantastic along with Ailsa’s hot pumpkin soup. Throughout season 2013/14 the Semaphore SLSC Board of Management has been undertaking a process of updating the constitution. The updated version of the constitution has been developed using the best practice templates provided by Surf Lifesaving Australia and Surf Lifesaving South Australia. A number of other clubs in South Australia have already adopted this template. By adopting a constitution that aligns with the state and national bodies, Semaphore SLSC will ensure that all of its policies and procedures remain up to date. The Board of Management is now seeking feedback on the draft constitution. There will also be an information session for interested members to discuss the draft in detail. The aim is to send out the final draft constitution to members with the Agenda for the 2014 AGM. The updated constitution can then be discussed and voted on at the AGM. 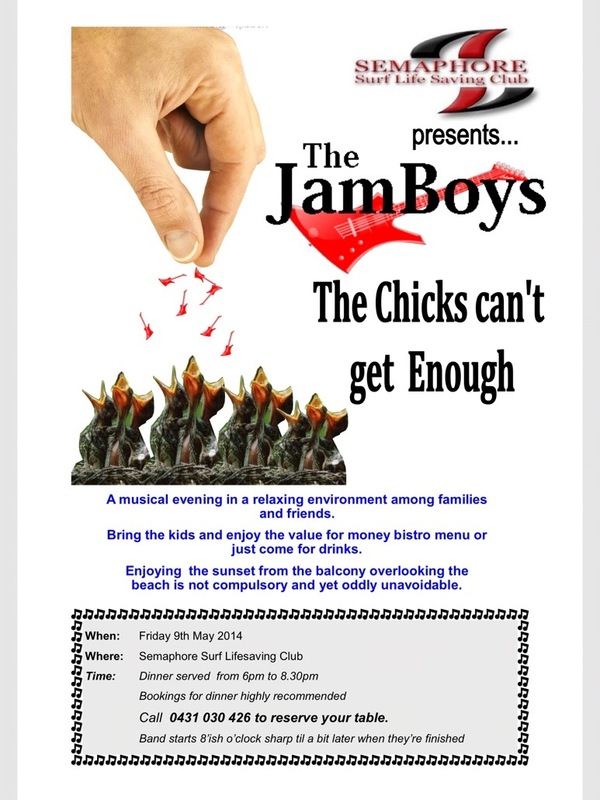 The Jam Boys playing this Friday! https://i1.wp.com/semaphoreslsc.com.au/wp-content/uploads/2014/04/20140429-132857.jpg?fit=300%2C257 257 300 Georgia Robbins http://semaphoreslsc.com.au/wp-content/uploads/2014/02/picmonkey_image-1.jpg Georgia Robbins2014-05-07 04:11:402014-05-07 04:11:40The Jam Boys playing this Friday! The Life Membership Committee is responsible for considering nominations for Life Membership from members. Nominations are endorsed by the Board of Management before being presented to members at the AGM (Sunday 27 July). Dale Welsh and Todd Bampton (Board of Management representatives) are now seeking nominations from three (3) Life Members to sit on this Committee and consider nominations. If you are a interested can you please contact Dale on 0433 315 349 or email dalewelsh0@gmail.com by May 18. Any members who are using the gym facilities in the club rooms must remember the requirements expected from you. You must ensure you are signing in and out of the gym every time you use it and ensure the gym is tidy at all times. Please remember only members who are financial and have been through an induction are allowed to use the gym facilities.